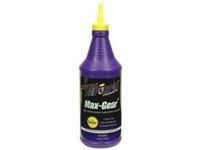 Royal Purple Max-Gear® is an ultra-tough, high performance, GL-5 automotive gear oil designed to provide maximum protection to heavily loaded gears while maximizing power output throughout the drive train. 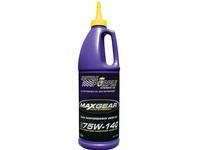 Royal Purple outperforms other GL-5 gear oils because it combines the highest quality synthetic oils with Royal Purple proprietary Synslide® additive technology. Royal Purple 85W140 Max Gear is recommended for use in truck, motor home / RV, and automotive front or rear differentials, manual transmissions and lower gear units of marine engines that specify use of an API GL-5 or GL-4 fluid.